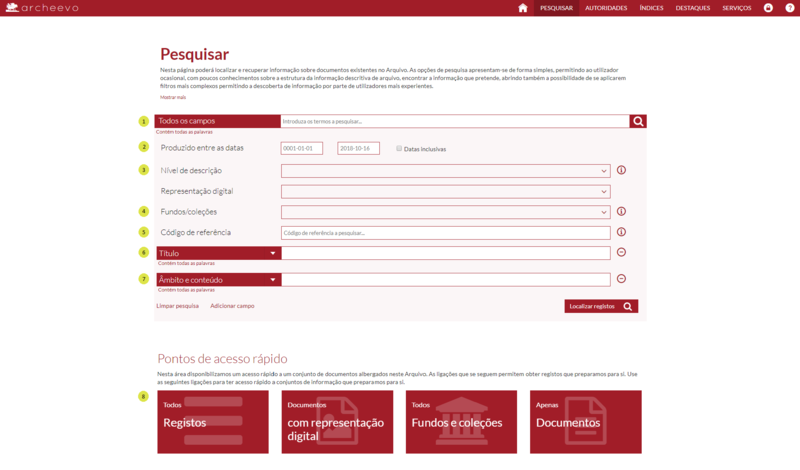 This portal enables you to locate documents available in the archival institution. This text exists to assist the user in locating these same documents. You are presented a general field where you can search one or more desired terms to obtain in the results, for this you are presented with a general field where you can search for the term (s) you wish to obtain in the results, regardless of the field where they are presented (1). The presented results will always be derived from the conjugation of all the selected criteria. Therefore, it will be presented all the documents which presents all criteria placed by the user. When the user has doubts relatively to one of the selected criteria, it is wiser to remove it, in order to obtain the expected result. The search interface is divided into 2 parts, one with search with filters (basic and advanced) and another with quick access points. Advanced filters are intended for more experienced users, or who have prior knowledge of the document being searched. Allows the user to combine a broad set of criteria. Here the search can focus on a specific field, rather than searching across all existing description fields. Quick access points provide quick access to hosted documents ("All Records", "Documents with Digital Representation", "All Funds and Collections" and "Documents Only"). The search by date range is also present, and has the same operating mode that the one explained previously (2). It is joined by the option to search inclusive that, meaning, search only by documents whose extreme dates are contained inside the defined interval. You may also search for the description level(s) of the document (3). The documentation is organized according to a structure of archival description that part from the general (Fonds or Collection) to the specific (Composed Document or Simple Document). It is possible to select which funds/collections where the search of the records should focus on (4). All fields listed above correspond to the fields that are used in frequent searches. However, the user can add more fields to the search by clicking "Search other fields." Each time you click, a new field is added to the search form. You change the selected field where you want to focus the search, the search terms and the type of search you want the system to perform (explained above for the "Title" field) (6). It is possible search for the scope and content (7) of the record you need to search. In the quick access points, just select the item you want ("All Records", "Documents with Digital Representation", "All Funds and Collections" and "Documents Only") and the information is automatically available (8). You can also search for type of entity (3) ("Corporate", "Family" and / or "Individual"). It is possible to search by reference code (4). If you have this element, it will be the best way to get to the registry you are looking for. In the quick access points, simply select the item you want ("Family", "Collective Persons", "Singular Persons" and "All Records") and the information is automatically available (5). The "Indexes" option is intended to present predefined searches or assist in the navigation of controlled vocabularies, visualizing for each term the relationships and associated documentation. Through the navigation of controlled vocabularies, in addition to being able to see all the terms that make up a particular vocabulary (and hierarchy), we can also directly access all the records that may be associated with each of the terms. Since it is not a page directly linked to the documentation search, this interface allows you to define highlighted documents (1), for a variety of reasons (eg highlighting a month's document, seasonal document exposure, etc.). In (2) shows the highlighted documents that the user can define from the application. The search results show the number of results of the conducted search and 10 results records per page. For each entry (1) is presented the common information, such as title, scope content, dates, reference code and the current physical location. A set of tools to view a file are available (7), namely image zoom or image rotation (4). This module allows the user to login into the system and submit requests for the documentation and other services, e.g. reproductions, consultations, searches, etc. The user can also follow the state of submitted requests, respond to solicitations made by employees of the institution, use a notepad, among other features. Note that, to get access to all these features, it is necessary that you are registered in the system, filling in some personal data necessary so that you can enjoy all the functionalities. The privacy of the user is safeguarded by the General Regulation of Data Protection (RGPD) as described in the "Services" page.